Cheese is my soulmate, so when Sarah W. sends me photos of her cheese plates (which she does every week or two), my heart speeds up and I get butterflies in my stomach. Then I remember that Sarah lives in Ohio and we can’t share. It’s the worst kind of long distance relationship. I have been enlightened, however, with the knowledge that I’m not the only one who eats cheese for lunch sometimes, and that it’s actually a socially acceptable thing to do as long as you lay it out prettily on a plate before consuming. If I pick myself up one of these gorgeous boards, I may even convince the world that my midnight raid of the cheese drawer is because I’m fancy, and in no way related to, you know, beer consumption. I think we’ve delved into my issues enough for one day, so I’m going to pass the cheese plate to Sarah now. If she can inspire me to be a little more classy, just think what she can do for you! Spread the cheese, Sarah! I don’t actually have a lot of meaningful memories associated with cheese or cheese plates (besides my mother telling me to never use low-fat or fat-free options because, “What’s the point?”), but I have to say, there are not a lot of things that rank higher than sitting outside on a beautiful day with a bottle of wine, a plate covered in cheeses, crackers, veggies, and fruit, accompanied by my best friend or husband. Two kinds of olives, pickled carrots, fresh cherries on the left. Gouda, pepperjack, 5 county cheddar, cucumber slices, sharp white cheddar, porter-marbled, and crackers. Perfect with white wine. So let’s talk composition. There are so many kinds of cheese. Washed rinds, soft cheese, goatsmilk, sheepsmilk, bleu cheeses, sharps, extra sharps, mild, layered, studded, alcohol-marbled. Going to the fancy cheese section of your local grocery store with the idea to lay out a bangin’ platter can be intimidating, let alone setting foot in a fancy cheese shop. And then, what if you don’t like your choices? Real Simple has a nice article on selecting cheeses and all the niceties that go along with that, but I don’t always like following rules. Off the top of my head (and from copious field research), I would have guessed cheese plates are usually grouped bleus, creamy, sharp, and mild, and I wasn’t far off the mark. But I’m bored already discussing textures and types. So how do you pick winners for your own cheese plate? Answer one is to taste everything. Any cheese shop worth its salt and cream will hand you a sample. Taste, ask questions. It’s a lot like wine-tasting in that you’ll eventually find yourself with a few solid staples that are both unique and undeniably suited to you. Which leads us to answer two: know your tastes. Sample a mango-studded cheese if you spend all summer obsessively squeezing mangoes at the grocery store to see if they’re ripe for smoothies. Try a cheese marbled with dark beer if your favorite part of St. Patrick’s Day is drinking your dinner in form of Guinness or other stouts and porters. Be on the lookout for ingredients that you know and love in other preparations — artisans put a lot of things in cheese now! To address the cheesy elephant in the room, if you have never liked any bleu cheese you’ve ever eaten (like my cheese-heathen husband), then ask your cheese shop associate what they’d recommend as an alternative. You might find yourself with a tasty gorgonzola or feta instead. Your guests will have a pungent cheese, and you won’t feel like you’re forcing yourself to eat mold. 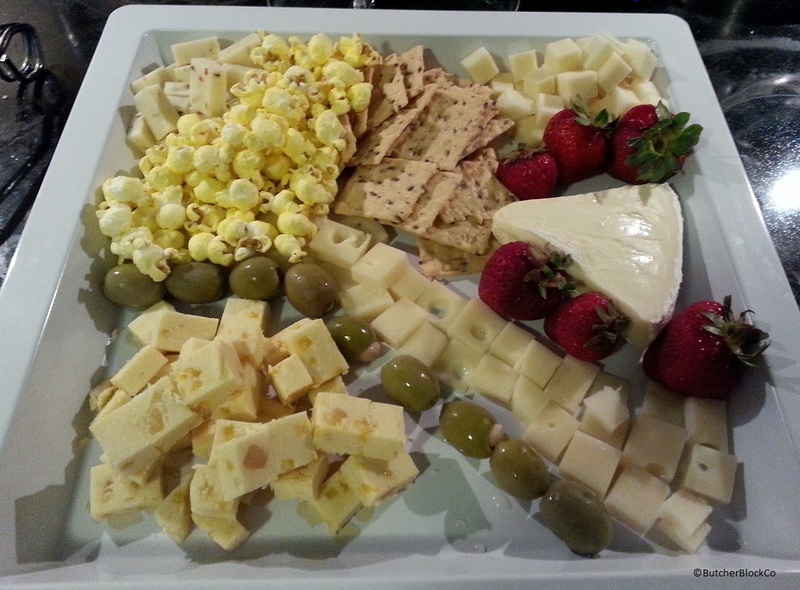 Pepperjack, multi-grain crackers, sharp white cheddar, brie with strawberries, swiss, garlic-stuffed green olives, mango-studded, and honest-to-goodness air-popped popcorn. Once you’ve settled on your cheeses, start thinking about what else you’d like to put on your plate — crackers, fruits, vegetables, meats. Brie with fresh strawberries is a super yum combination that finds its way onto my platters on many occasions. The beef sticks I’ve known my whole life as “smokies” make a great accompaniment sliced into inch-long pieces, while thick slices of fat smoked sausages and summer salamis are also a great standby. I have a little garden, and fresh cucumbers and green beans make their way onto my plates, as well as pickled carrots from the year before. And if you love the taste of salty, pickled things, grab feta- or garlic-stuffed olives as garnish. Fresh berries and cherries make a sweet statement against mild cheeses like jarlsberg and swiss. Multi-grain crackers, cheese crisps, even the humble saltine all make mini cheesy sandwich bites, and one of the most delightful things I’ve put in a cheese assortment has to be popcorn. Because why not? These Vans gluten-free cheddar crackers are one of my favorite finds for cheese plates. Super thin and crunchy! 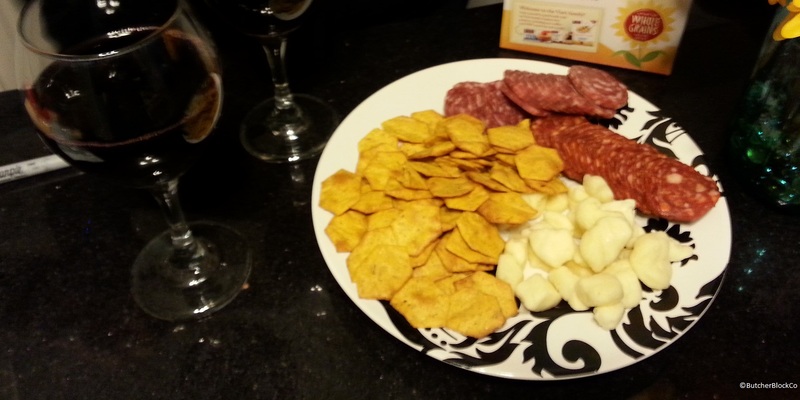 Soppressata and salami picante are great cheese plate additions, and white cheddar cheese curds are the main attraction. 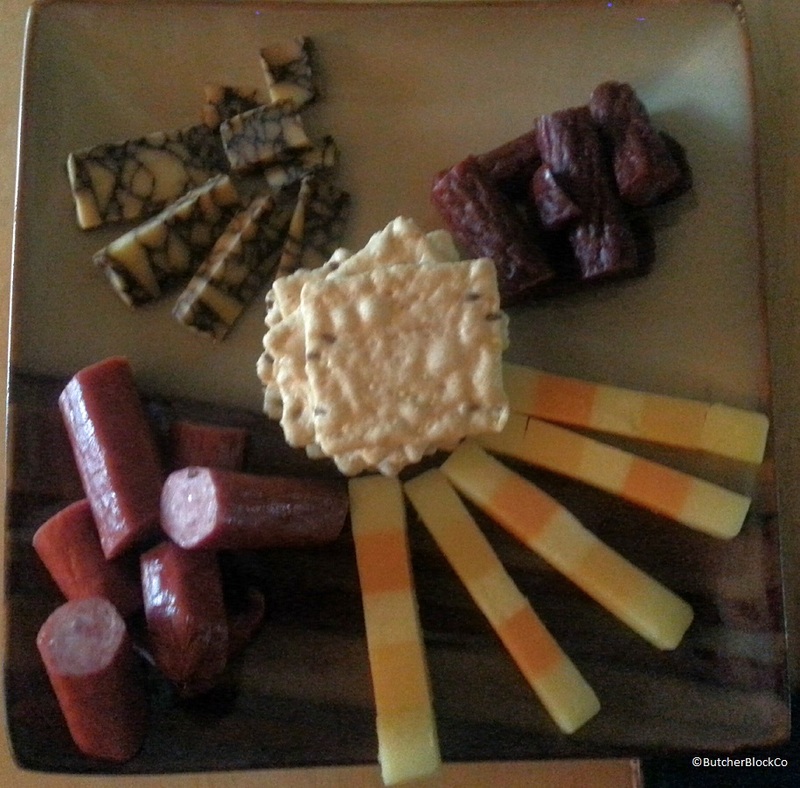 The only real rule I’ve come across in cheese plating is to keep wet things (olives, freshly-washed berries, pickles) away from anything they will get soggy (crackers, popcorn, chips). Other than that? Go nuts! I, personally, am not one for smears and smudges of jams and chutneys on a cheese plate, but you do you. Heap preserves on top of a small wheel of brie and pop it in the oven for about 8 minutes. Absolute heaven. To prepare your cheese for plating, let it guide you. Firmer cheeses do well in thin slabs that easily stack on crackers. Softer cheeses can be cut into rough cubes with a very sharp knife, or allowed to crumble as they will. Creamy cheeses and spreads need to be accompanied by a knife. Layered cheeses, like my 5 county cheddar favorite, made a cute presentation cut into little matchsticks, but it wasn’t the most stable, and liked to fall apart. You can make your cheese plates as Alice in Wonderland landscape-ish or as neat as you’d like. Fan out slices or make a pile of cubes — it’s all up to you! A last few recommendations: Slice your cheese reasonably close to when you plan on serving it. After several hours, it can start to get hard around the edges and get that greasy, unappetizing sheen. If you have leftover cheese, the best thing to do is have a leftover cheese plate for lunch the next day! Check out this guide on the best ways to store cheeses based on type. I’ve had good luck wrapping cheese in parchment, then plastic wrap, although sometimes you still need to trim hard edges, which is fine! Using the same cheeses over and over won’t get repetitive provided you add something new each time. Finally, I didn’t address dried fruit or nuts, but those are both excellent cheese plate accompaniments. So, what’s your favorite kind of cheese? Does talking about cheese texture bore you to death, too? What’s the most unique cheese you’ve ever tried — and was it good? It’s March Madness once again. I’ll never forget the look on my husband’s face last year when he walked in the door after watching the championship game. His team had won, yet all I saw was defeat, exhaustion, disappointment and …was it hunger? Our neighbor had invited 5 of “the guys” over to watch the big game. My husband, who usually doesn’t live and breath March Madness, decided, sure, it’s a good guy-thing to do, should be fun to hang a bit, drink a little beer, eat a bunch of food and watch a good game. I guess Fritos and bean dip was the best his friend could come up with! Why four grown men did not have the courage to say, “hey, this is ridiculous, I’m hungry, let’s order a pizza” I will never know. Point 1 – Always have enough food – The best parties are the ones where the food lasts for the entire night. Not much fun showing up an hour into a party and seeing only a few whole grain crackers left in a bowl! It is always easier to have smaller amounts of several different kinds of food, than it is to have a lot of one kind of food. That way if you have leftovers, it is pretty simple to store in your refrigerator or pantry for the next get together. Try to have a protein – we’re talking meat – available too, not just carbs. Point 2 – Have a variety of drinks – Remember, just because you like wheat beer, doesn’t mean everyone likes wheat beer. Find a mainstream beer, or make it fun and get a wide variety of beer and make it an informal beer-tasting event too. I always have a white wine on hand for those who don’t feel like having beer, or like me, never acquired a taste for beer. Again, pick a wine that is balanced between dry and sweet, like a Pinot Grigio (please no more Chardonnay). And finally, keep in mind some folks may not want to drink alcohol, so always have water, soda or lemonade available. Point 3 – Presentation matters – With very little effort you can make chips and salsa look like a fancy party! Put your chips in a fun basket, display appetizers on a unique cutting board or serving board, add olives or nuts in a few colorful bowls, and drape your serving area with a decorative placemat or tablecloth to pull it all together. This March Madness, I suspect we will be entertaining. My husband, who I consider just shy of “a chef” will surely want to whip together some special appetizers. And I will do what I do, which is clean the house, do the shopping, and get all my serving pieces out of the cupboard to entertain with style!